Album Release show at The Rose Barn with Ferdinand The Bull! Nameless in August is releasing their most comprehensive work to date, a fully produced studio album that spans over four years of original material and we couldn't be more excited to share it with you! Join us for a one-of-a-kind release show at the beautiful Rose Barn in North Park, PA. Tickets on sale now! https://www.brownpapertickets.com/event/3624643 The album was engineered by Daniel Carballal, mixed by Dave Hidek, and mastered by Garret Haines all of Treelady Studios and The Church Recording Studio. And what a job they all did! Opening the show will be fellow folk band Ferdinand the Bull! Their wonderful recent release "Painting Over Pictures" is currently on all digital media outlets and will be available at the show. https://www.facebook.com/ferdinandthebullband Your copy of the CD will be included with your admission! Doors at 7pm, show at 8pm This will be an all ages event. Drinks/refreshments will be available (Grist house beers will be featured!) The Rose Barn is located across the street from Over The Bar Bicycle Cafe at The North Park Boat House. Feel free to grab dinner at their restaurant before the show! Free parking available just beyond the Rose Barn in adjacent lot and at other nearby lots. 10000 Pearce Mill Road, Allison Park, PA will get you there via GPS, but realize this is an approximate address--look for the sign (pictured above). 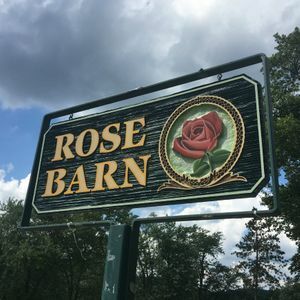 With Waze, you can search directly for "Rose Barn" and it will be accurate. Capacity is limited so please reserve your spot online using the ticket link. Note: Since this event is taking place on park grounds, all transactions will be considered a suggested donation. Cool venue and a great show!